Walking on tread mills right in your own home! Now THAT sounds like it could be fun. Whether you're just beginning to walk or ready to move on from our Level 3 Fitness Walking Program, you can have the freedom to create, adapt and enjoy walking right in your home. The beauty of having your own tread mill is that you can use it for just about any type of walking you want. Set up your programs based on our programs here or make your own. You can even watch TV, listen to your own music or a really neat one is Scenic Trex Beachside Jungle DVD - Virtual Walking, Cycling, Treadmill Workout. You can escape into your own world and enjoy 'walking' in some great places from the comfort and privacy of your own home. HINT: The bigger your new flat screen TV, the more realistic your journey (just in case you needed any more reasons to get one)! By now we don't need to remind you of the importance of getting a checkup from your doctor before you start any program here. It's as important as ever with these machines because you can really ending up working very hard as you get into it! Walk in the comfort and safety of your own home. Dress any way you like! We do recommend proper workout clothing though, proper walking shoes or athletic shoes. They all add to your enjoyment and comfort with the experience. You walk on a smooth, consistent surface. Set up near your window. Get some fresh air and sunshine while you're walking. Ahh the best of both worlds! Control the time, speed and tilt angle of your walk. Note that better machines also let you walk on a down angle to better strengthen all the muscles. You can watch television or motivational and landscape DVD's as you walk! Better treadmills can be programmed. Create your own treadmill walking workouts or enter our fitness walking programs! Yup, despite all those neat benefits there are a few minuses you need to be aware of too. You're inside and not enjoying the fresh air, sunshine and other 'weather' in your face. You usually walk alone. If you're a social person this might be an issue. Some units can be quite noisy. This tends to be more of an issue in the lower cost units. There can be a boredom factor with time. Creating your own programs can reduce this possibility. More variety helps to keep your interest up! They do use electricity that outdoor walking doesn't. They cost a fair bit of money - typically in the $1,500-6,000+ range for a quality machine. They can take up a fair bit of floor space in your home - typically about 16.75 square feet. A folding treadmill can reduce that by about six square feet. The belt bed of the tread mills should be at least 58" long, longer if you or family might also use it for jogging. If it will only be used for walking than a shorter bed will be OK. 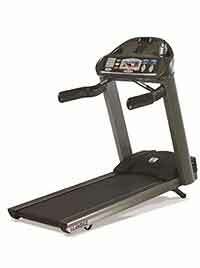 The belt deck width of the tread mills should be at least 20" wide for safety and comfort. Some of us may cut a little wider path when we walk now than we did in the 'old' days. The side rails or straddle pads (at the edges of the moving belt area) should be wide enough for you to safely put your foot on as you step on or off while the belt is moving. 6" is good. Choose the best drive system with the 3es included. (The Baldor Motor Drive is one of the best.) The motor should not sound like it is laboring when you're walking on it. Pick the proper performance level for your weight. Heavier people require a heavier duty machine. Choose a machine that is rated for at least 50 pounds heavier than the heaviest person who will be walking on it. The best machines can easily handle people weighing 350 pounds. Choose tread mills that allow you to record or create your own custom programs. At least one program per person using the machine is good. More is better. You may not need all the preprogrammed treadmill walking workouts that some treadmills offer. No need to pay for something you may never use. Being able to add your own should be your priority here. More variety this way! One neat idea to add variety to your workouts. Show a walking DVD on your TV in front of the machine. You can get these showing many different and interesting areas of the world. Walk the world from your home. Cool! Look for a speed control that allows you to start very gradually from a standstill. This way you can get on the machine with the belt stopped and slowly bring it up to the speed you want. Some jump from stop to a start speed that can jerk you if you're standing on it when you start it. You may want a heart rate monitor - either included or as an option. The wireless one is great - usually a belt you wear around your chest. You can watch your heart rate as you walk, power walk or even run. No wires to get in the way. Many tread mills have a touch area on the machine to get a heart rate reading too. This is fine when you're not walking. Not so convenient if you need to grip or touch something on the machine while you're walking. Choose tread mills with a walking belt that is heavy enough to last but not so heavy it causes the motor to overheat and fail early. A good belt (4 ply as an example) is better than a 2 ply belt. When the belt stretches with use (which they all do), the 2 ply belt can stretch to the point where you run out of tightening adjustment room before the belt wears out. It will need to be replaced much sooner because of stretch - not wear. Choose a machine with the best warranty you can find. Clearly a lifetime warranty would be the best! You want a stable, rugged and sturdy machine that provides a smooth ride and feels solid. The handrails should feel sturdy and provide good support. They should be in a good position that doesn't block your arm motion as you move. Pay close attention to the engineering quality. Good engineering can get a lot more from average components. It makes superior components totally shine! The reverse is seldom true. Here's our approach when we're deciding to make a major purchase, especially when there is a chance we might outgrow it or no longer use it. In a word - QUALITY! Quality makes our experience more enjoyable and worry free. Quality costs less in the long run and when the time comes, Quality is easier to sell! Pretty simple really. You know the saying - you get what you pay for. When it comes to a tread mill, we must admit that some of the benefits we would include may not all apply just to you or even to us. Things like a 350 pound user, several hours a day of use, many different users, people who may be runners rather than walkers, people who would be much harder users of the equipment than we will ever be. We just like to keep our options open and have something of real value to sell if that day comes. We must admit that we did a LOT of snooping into everything we could find about these machines over many weeks. We're very comfortable and confident in recommending the Landice L8 LTD Executive Treadmill to you. It's just the ticket for us more 'seasoned' types. With this exceptional quality it would also be really easy to resell in the future. Have a look at these videos to see a more complete description of what goes into these machines. Boy have they come a long way with these things! NOTE: We're not equipment specialists. This machine is a 'cadillac' version that we feel at our age has the features, benefits and added quaility we deserve. We list the features pointed out to us by many folks specializing in tread mills. We agree and have added a few of our own from an 'oldies' point of view that those youngsters might not tweak to. When you are first starting to work on a treadmill please have a friend there with you. These are mechanical devices. Until you are fully comfortable with their operation, this is a highly recommended safety measure. Start slow. Go easy. And really important …know where the STOP BUTTON is! These are moving machines! Enjoy your many new adventures ahead!